Central Sheds manufacture and install timber buildings for individuals, businesses and organisations across Scotland. We not only serve Falkirk and the surrounding areas but as our name suggests we also supply timber buildings throughout the central belt of Scotland. We are fortunate to have built our business on word of mouth over the years and take pride in any projects large or small. Our workshop and display area is based in Denny near Falkirk and we welcome anyone by appointment to discuss your timber build. These days you can buy sheds or timber garages in kit form over the internet or more conventionally from a display down your local garden centre but if you live locally we would urge you to speak with us first before making a decision. We purchase our materials from local suppliers and deliver and install ourselves. By buying from Central Sheds we believe you will not only be getting a better quality product but other local companies will also be benefitting from your investment. It is a fact that many of the kits or timber components sold over the internet or in large garden centres are produced and shipped in from countries like Poland and Hungary. We pride ourselves on our local service, quality workmanship and aftersales support. Whilst we understand the attraction of online companies, or 0% finance deals on Summer Houses, from experience we know we can offer you a genuine alternative at a very reasonable cost, but importantly everything that we build is backed by our local friendly business. 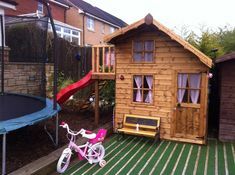 Central Sheds are a family run business with over 20 years of experience in the construction of sectional timber buildings; sheds, garages, summerhouses and children's play huts. Our business was established almost 20 years ago by Alan McEwan a time served joiner from Falkirk and a member of the Guild of Master Craftsman. Over the years we have built some incredible structures from the functional to the bizarre. If you can dream it, Central Sheds can build it! No matter if it's an oversized Man Cave to house a full-size snooker table or your very own Garden Pub, we have the skills and the experience to design and build you exactly what you've dreamt of. We are a family run business living local to Denny, in Stirlingshire. We manage the whole process from quotation to erection and commissioning of your timber building. We are proud members of the Guild of Master Craftsman, a sign of quality and trusted trade organisation. We only use high quality materials in our builds, all of which are locally sourced and checked by our craftsman. Selected for durability and long lasting properties. We understand that everyone wants good value but that not all things are created equal. Our simple pricing model is easy to understand with no hidden charges. At Central sheds much of our business is devoted to building large garden timber structures, we build affordable garden spaces that can be used as a garden office for freelancers or home workers, or as a flexible space for busy business owners. 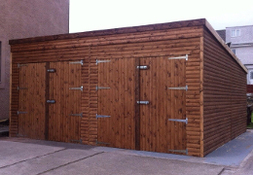 Central sheds supply heavy duty timber garages and workshops that can be customised to suit your requirements. Combined with traditional timber windows and doors our structures are built to withstand the extreme Scottish weather. Big, small, pink or blue at Central sheds we have a summerhouse that can be built just for you. Our garden sheds are built to last to a very high standard. You can have your choice of materials used; tongue and groove, shiplap, loglap or the latest engineered composites, the choice is yours. An outdoor space can be magical for a child and at central sheds we just love to build spaces for little people. Our wooden playhouses are constructed using high quality timber and great care is taken to produce a superior finish. At Central sheds we build just about anything as long as it's made of timber. 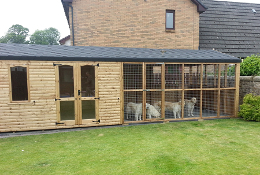 and as you can see from some of our photos we have built a wide range of animal housing ranging from dog sheds and catteries to aviaries and stables. 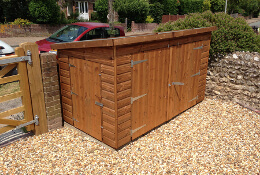 Central sheds manufacture outdoor storage in all shapes and sizes to suit various uses. If perhaps you don't have the room or requirement for a large shed in your garden, a wooden garden store is the perfect answer to keep things safe and dry. Are you looking for wooden garden furniture? 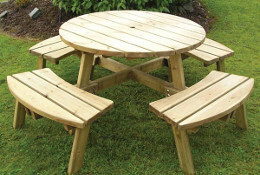 We now stock a fantastic selection of high quality garden furniture that will compliment any of our timber buildings. At Central Sheds we have a number of ways to finish the interior of your timber structure. 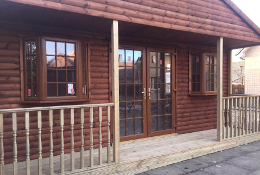 timber buildings to individuals and businesses. 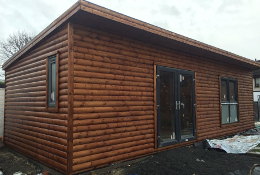 Just look at this huge timber shed that we have just completed in Camelon Falkirk. It stands at 4 metres tall and is built using 3x2 framing material and 32mm loglap butted together. We aim to offer a personal service to people wishing to purchase a quality timber building, whether standard or bespoke. Central Sheds is committed to ensuring that you get the perfect addition to your garden. I recently appointed central sheds Ltd as our new shed supplier for Highwater private water supplies. I found central sheds from a google search. Very quick response and positive answers to our shed specifications and requirements. Great communication and expertise in the product. 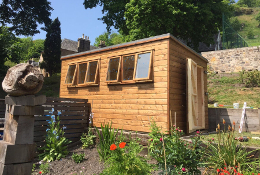 I am so pleased I found Central Sheds online, I spoke with several timber building companies locally before choosing Alan and his team for my 6m x 5m garden timber office. They were by far the most flexible with my requirements and very friendly to deal with. It was delivered on time and to my exact specification and I couldn’t be happier with the finished product. The communication was excellent and it was great value for money when compared to other suppliers in the area. We were looking for a timber garage for our car but with additional room for a workbench as my husband likes to do his own repairs and maintenance. 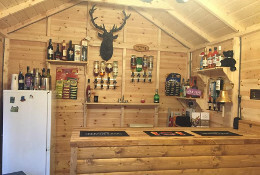 We were recommended by friends who had just bought a garden shed from Central Sheds and after speaking with Alan we had a very reasonable quote and a date for the install, my husband is delighted and we would highly recommend Alan and his team.